Travel along the Niagara Parkway towards Niagara-on-the-Lake to visit the famous Floral Clock, located north of the Botanical Gardens. This unique attraction is a very popular stop on the Niagara Parkway and is photographed almost as often as the Falls! The intricate designs on the face of the timepiece are created with up to 16,000 carpet bedding plants. The floral design is changed twice each year, featuring viola in the Spring and four cultivars of Alternanthera along with green and grey forms of Santolina Sage during the Summer and Fall. California Golden Privet and Blue Festuca Grass may be used for contrast. The intricate designs on the face of the Floral Clock are created with up to 16,000 carpet bedding plants and are changed twice each year. 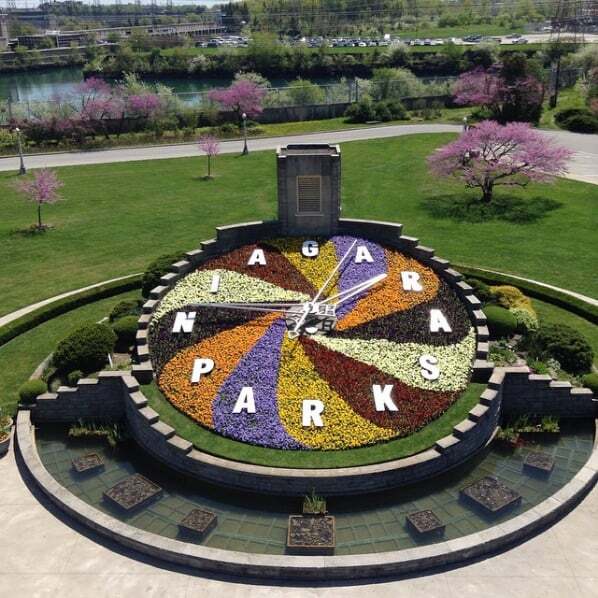 The planted face of the Floral Clock is maintained by Niagara Parks horticulture staff, while the mechanism inside is kept in working order by Ontario Hydro, the organization that originally built the clock. The tower at the back of the clock houses Westminster chimes that greet each quarter hour. The grounds surrounding the clock feature bedding displays and a tower at the back of the clock houses Westminster chimes that greet each quarter hour. If the door into the tower is open, you can take a glimpse at the clock mechanism and enjoy photographs that show the history of almost every face design all the way back to 1950.